Imagine being focused whenever you choose, having a wonderful memory and improved recall, being able to read and study much faster, being organized and efficient, and also being confident in using your abilities anytime. With the use of hypnosis all of this is possible- and more! Hypnosis is a state of heightened concentration and relaxation. As such, it is an excellent treatment for concentration and attention difficulties. It helps one focus on relevant and important information, bringing it to the forefront of one’s mind while helping information of lesser importance recede into the background. Hypnosis can also help you sharpen your mind and develop the utilization of your permanent memory by accessing the powers of your subconscious mind, and this is the source of your permanent memory. Everything that you’ve ever heard, read, saw or experienced is stored within your subconscious mind. When your mind is calm and focused it can easily access all the information it has ever received. With Catalyst Hypnosis Center’s Study Skills &amp; Exam Performance MP3, no longer do you need to approach your studies with dread. No longer do you need to fear exam day. By learning how to relax your mind, it is free to absorb new information while studying and access that information whenever the need arises. With these skills, you will be able to pass your studies and exams with confidence and ease. 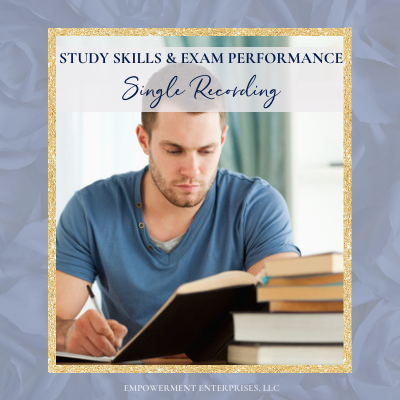 Study Skills &amp; Exam Performance Hypnosis MP3 can help you acquire the skills necessary to improve your study skills and exam performance so you can perform at your peak and get the grades you deserve! All of Catalyst Hypnosis Center’s MP3s contain bilateral inductions. For best results listen to these hypnosis sessions with headphones. As with most Hypnosis MP3s and CDs, do not listen to these sessions while driving or doing anything that requires your conscious attention.